If you say his name, he will be immortal. This is the last thing you see as you leave the exhibit. While on holiday visiting my family in Los Angeles, I saw the iconic image of King Tut on banners all over the city. I've been living under a rock and didn't know that there was a new multi-city exhibition - the long-dead pharaoh's last time traveling before his final rest at the new Grand Egyptian Museum. Two years ago we had taken my now 5 year old to a mummy exhibit at the LA County Natural History Museum. She loved it so much (still talks about it!) that we decided King Tut was right up her alley. And boy was it. On display at the California Science Center until January 2019 before heading to Europe, King Tut: Treasures of the Golden Pharaoh features 150 artifacts from the Boy King's tomb - 60 of which have never traveled outside of Egypt before. Multimedia displays gave the exhibit an ultra-modern touch. When you first enter, you watch a roughly 5-minute video on a curved screen (it looks like the images are melting into the building, it's really neat) giving backstory about Tutankhamen and Howard Carter. It had high production value and looked like one of the History Channel's non-alien related docu-shows. The exhibit was split onto two levels. On the top floor you were immersed in the pharaoh's treasures and information on ancient Egyptian burial practices. The bottom floor was dedicated to the finding of the untouched tomb, new findings about Tut's death and lineage (spoiler: blow to the head), and how Tut has impacted popular culture since he was rediscovered. I thought it was interesting how the exhibit as a whole really accentuated this idea of Tut and Carter as linked across time. King Tut was virtually erased from history due to the political turmoil of his time, and Carter was about to lose his funding from Lord Carnarvon (Downton Abbey fans! This was one of the owners of Highclere Castle, the house used in filming. Highly recommend you read Lady Almina and the Real Downton Abbey as they go into detail about his involvement in the find). The exhibit used this theme of the underdog to great effect. 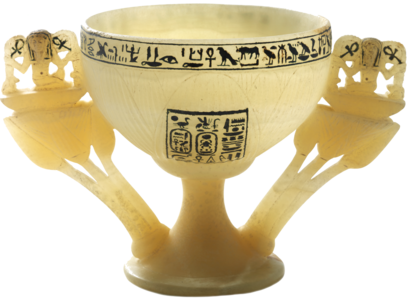 My favorite objects on display were the sentinel that guarded his tomb, the wishing cup, a calcite head stopper (these sat atop the jars in the canopic chest which housed Tut's organs), and a massive broken statue of the king. Calcite head stopper, photo source unknown. At the airport on our way home, my 5-year-old saw a magazine with Tut on the cover and announced to the store, "There's the history." People chuckled kind of confused and then she said, "It's King Toot-ank-ommon," to which the store erupted in laughter. What can I say, my kid is amazing. Know before you go: Tut's mummy and the famous death mask are not on display. They are forever in Egypt at this point. I had no idea, but the Space Shuttle Endeavor is on display and your ticket to Tut gets you in to see it. Endeavor is absolutely massive and breathtaking. It kind of made me teary. Don't forget to see it. I'm not known for my photography skills, ok? This is part of a series of posts on the historical figures that are the inspiration for Immortal Perfumes. For more historical figures click here. Frontier life was no picnic – especially not for women. In the Old West, if a woman was to survive she had to have a certain level of luck, charm, and resourcefulness. Enter Eleonore Alphonsine Dumont; also known as Madame Moustache. Originally born in France (or so she claimed), Dumont was a notorious gambler who made her mark during the California Gold Rush. She hustled from town to town dealing cards and running brothels from Tombstone, Arizona to Nevada City, California. At the time, it was rare for a woman to deal and the novelty of her profession, not to mention her beauty and charm, drew in miners from all around. In Carson City, Nevada she bought herself a ranch and fell in love with a man of high charm but little substance. Jack McKnight conned her out of her considerable gambling fortune and Dumont was left destitute. She gave up the ranch and with dogged determination she returned to the gambling circuit, traveling around and rebuilding her fortune. Dumont eventually founded her own gambling house, “Vingt-et-un” (21), for stylish, well-kept men - no ladies save herself allowed. When her beauty began to fade and the attention of the miners waned, she became known as Madame Moustache owing to the line of dark hair above her upper lip - which she wore with pride. To capture the scent of a well kept lady from the Old West, the Madame Moustache perfume oil has notes of fire, vanilla, tobacco, and (vegan) Egyptian Musk. The tobacco and fire symbolize the dirt and grit of a hard life on the frontier while the vanilla and musk soften it up for a rich, feminine scent.